Shane van Gisbergen proved to be the king of the Mountain on Saturday, with the Kiwi storming to overall pole for the Liqui-Moly Bathurst 12 Hour in a new event qualifying record. Van Gisbergen took his No. 59 Tekno Autosports McLaren 650S GT3 to a best lap of 2:01.286 in the Top-20 qualifying shootout, besting his 2:01.591 time in Q1 that would have also put him on the top spot. The V8 Supercars ace claimed the Allan Simonsen Pole Trophy, with a time that smashed Laurens Vanthoor’s 2015 record-breaking qualifying lap by more than 1.2 seconds. McLaren GT factory driver Alvaro Parente and Jonathon Webb will join van Gisbergen behind the wheel of the 650S GT3 on Sunday. The No. 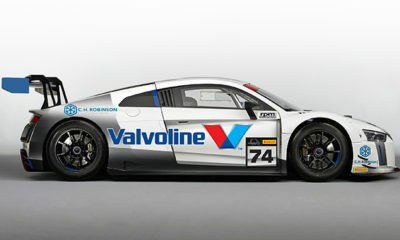 75 Melbourne Performance Center Audi R8 LMS of Rene Rast qualified second with a 2:01.840 lap set in Q2. It was just 0.044 seconds quicker than Warren Luff’s time that put the No. 11 Objective Racing McLaren third overall and quickest of the GT3-Am entries in qualifying. Cristopher Mies (Melbourne Audi) and Will Davison (Tekno McLaren) completed the top-five overall, with the No. 37 Keltic Racing McLaren in sixth, ahead of the pair of M-Sport Bentley Continental GT3s. Vanthoor, meanwhile, qualified an uncharacteristic 9th after his pole-winning run last year, while both of the Erebus Mercedes-Benz SLS AMG GT3s and defending race-winning Nissan GT-R NISMO GT3 will start from outside the top-10. Grove Motorsport claimed pole in Class B, thanks to a 2:08.747 lap by Scott McLaughlin in the 60-minute combined class qualifying session, held prior to Top-20 shootout. V8 Supercars ace McLaughlin will share driving duties with Porsche factory driver Earl Bamber and team owner Stephen Grove. The No. 65 Daytona Sportscar Coupe, meanwhile, took Class I pole, qualifying 25th overall in the 36-car field. The Liqui-Moly Bathurst 12 Hour gets underway Sunday at 5:45 a.m. local (Saturday, 1:45 p.m. ET).